The additional card I pulled for Phoebe is The Empress, which is one of the most powerful female energy cards in the deck. The Empress is the great earth mother and represents healing, nourishment, fertility and abundance. It has to do with feminine sexuality, pregnancy and maternal instincts. The Empress might have to do with motherly figure in your life. This may be your own mother or someone who has stepped into that role. This person would be a very strong influence in your life -- very loving and supportive. You also look to this women for approval and support. Phoebe, you commented on fertility, and it feels like this is a big issue for you right now. 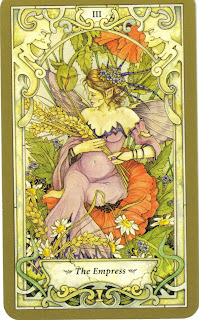 The Empress card directly speaks to the issue of fertility (as you can see the hint of pregnancy from the picture on the card). The Empress asks you to look at fertility from a physical point of view -- the creation of a baby, and from an energetic point of view -- the creation of ideas (bringing something to fruition) and the full understanding of the concepts and life lessons you are learning. You also mentioned about your husband wanting to be close to you. With The Empress energy, you are almost irresistible to him and to other males around you. Your full femaleness calls to them -- even without you being aware of it. The Empress is a strong, passionate, graceful and powerful woman. Step into the fullness of this beautiful power and feel your energy glow. Abundance is there for you. Wow! What a fantastic card for Phoebe right now! Thank you so much for doing this for me. The first thing I noticed about the card was that the Empress looked pregnant! I really appreciated your whole interpretation. These cards are wonderful. I'll have to check out these decks sometime. Thanks again! You made my day! I love that Phoebe was the lucky recipient of your talents this week. Thanks so much for pulling this card for Pheobe. It is a fabulous card for her (and a great card for me). For some reason I get the pull of nature and finding your inner strength from this card and it truely speaks to me as I embarck on my second ivf cycle with a surrogate (and I decided that I had to go on vacation for a week back to see the ocean and reconnect with my family).